La destinée de quatre photographes de guerre pendant les derniers jours de l’apartheid en Afrique du Sud. De 1990 à 1994, quatre photographes vont couvrir les dernières années de l’Apartheid en Afrique du Sud. Greg Marinovich, Kevin Carter, Ken Oosterbroek et João Silva vont former un quatuor de choc qui va outrepasser les dangers et photographier les conflits dans des zones « interdites aux Blancs ». Leurs prises de risques vont leur valoir le surnom de Bang Bang Club. The Bang Bang Club was a name primarily associated with four photographers active within the townships of South Africa during the Apartheid period, particularly between 1990 and 1994, from when Nelson Mandela was released from jail to the 1994 elections. Kevin Carter, Greg Marinovich, Ken Oosterbroek, and João Silva were the four associated with the name, although a number of photographers and photojournalists worked alongside them (such as James Nachtwey and Gary Bernard). A movie about the group, directed by Steven Silver and starring Taylor Kitsch, Ryan Phillippe and Malin Åkerman, premiered at the Toronto International Film Festival in 2010. 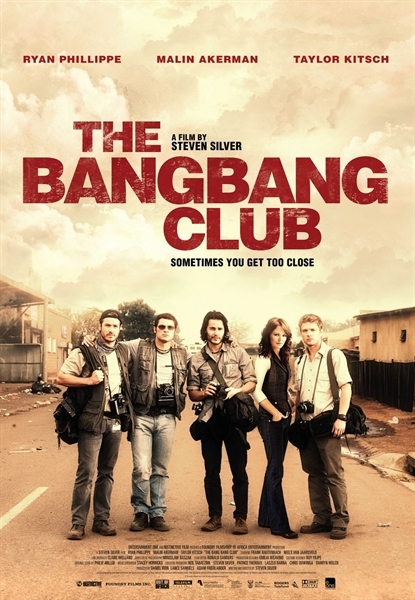 The Bang Bang Club is the real life story of a group of four young combat photographers – Greg Marinovich, Joao Silva, Kevin Carter and Ken Oosterbroek – bonded by friendship and their sense of purpose to tell the truth. They risked their lives to tell the world of the brutality and violence associated with the first free elections in post Apartheid South Africa in the early 90s. This intense political period brought out their best work (two won Pulitzers) but cost them a heavy price. Based on the book of the same name by Marinovich and Silva, the film stars Ryan Phillippe, Malin Akerman and Taylor Kitsch and explores the thrill, danger and moral questions associated with exposing the truth.